Join superb tall ship Royal Clipper on this 10-night cruise from Rome to Venice taking in the exquisite beauty and captivating history of Italy and Croatia with visits to Taormina, Corfu and Dubrovnik. Experience the romance of a voyage under full sail on the five-masted Royal Clipper on her unique voyage from Rome to Venice. Ponza is the first call on this fascinating cruise, offering a taste of true Italy on a laid-back island of outstanding natural beauty. No less charming, enjoy the sophisticated and cultural appeal of Capri and historic Taormina, blessed with spectacular views of snow-capped Mount Etna. Discover the diverse delights of Corfu and sail the sparkling Adriatic Sea to the stunning Croatian coast, with highlights including historic Dubrovnik which has impressive city walls. Embark Royal Clipper in Venice. The beautiful town of Rovinj is a delight to explore. Stroll along the narrow, cobbled streets which are lined with colourful houses and discover the charming old town with the tower of St. Euphemia Church marking its highest point. The towns harbour is lively and the streets are filled with art galleries and bustling bars and restaurants. The popular island of Hvar has something for everyone; a lively nightlife, seafood restaurants, good bathing beaches, excellent local wines, and the peaceful villages of Vrvoska and Jelsa. For swimming, perhaps cross to the little island of Scedro. Dubrovnik is a treasure made more precious by its miraculous restoration. Crowned by the Minceta Tower, stroll the 10th-century city walls for views of the city and the sea. The graceful Stradun leads to the Franciscan Monastery, restaurants, shops and the Sponza Palace. Medieval Kotor sits at the end of a stunning fjord, backed by wooded hills, with winding lanes, picturesque little squares and an Italianate flavour inherited from a period of Venetian rule. Dominating the town is the magnificent Cathedral of Saint Tryphon. Corfu is one of the most beautiful Greek Islands, near the Albanian coast. Relax on the Liston arcade or see the rocky bays and pristine beaches at Paleokastritsa which are overlooked by the monastery of Theotoku. Taormina is full of culture, history and shopping opportunities. For pastry shops and upmarket Italian designer boutiques, go to Corso Umberto, or for exquisite views of the sea and Mount Etna, visit the much-photographed Greek amphitheatre. There is a cable car from Taormina down to Mazzaro Bay and the nature reserve of Isola Bella. 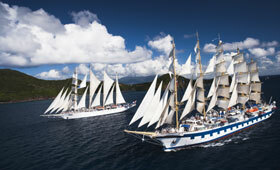 On the 2019 Rome to Venice sailings, Royal Clipper docks at Giardini Naxos for Taormina. Sorrento is perched above the sea overlooking the Bay of Naples. Sample the locally-produced liquor, Limoncello at one of the cafes on Piazza Tasso, or perhaps take the Circumvesuviana train to nearby Pompeii. There is also an optional tour to glamorous Capri or Pompeii. Spend the morning in Ponza, with its beautiful coastline with rocky coves and cliffs which are rich in the precious mineral white betonite, sandy beaches and crystal clear water. This afternoon, cruise to Palmarola, a craggy island in the Tyrrhenian Sea. Captain reserves the right to alter the itinerary to suit wind and weather conditions. Please note: the reverse itinerary is a 11-night cruise which visits Piran. Taormina is full of culture, history and shopping opportunities. For pastry shops and upmarket Italian designer boutiques, go to Corso Umberto, or for exquisite views of the sea and Mount Etna, visit the much-photographed Greek amphitheatre. There is a cable car from Taormina down to Mazzaro Bay and the nature reserve of Isola Bella. En route to Corfu, enjoy the elegant surroundings aboard Royal Clipper. Explore the picturesque island of Vis, the most westerly of the Dalmatian islands. It was closed to tourists for a long time and boasts a rugged coastline with secluded coves. The beautiful island of Krk is connected to the mainland by a bridge. It has a pretty medieval old town, overlooked by a stunning Romanesque cathedral, 15th-century castle and the remains of the ancient town walls. The stunning island of Cres is located in the northern part of the Kvarner Bay. It has an impressive 16th-century Venetian Tower and Arsan Palace which houses the fascinating Cres Museum. Disembark Royal Clipper in Venice. Captain reserves the right to alter the itinerary to suit wind and weather conditions. Please note: the reverse itinerary matches the 2019 itinerary. PLEASE NOTE: The 5th September 2020 departure is a 10-night cruise and follows the 2019 reverse itinerary from Venice to Rome.